PALMDALE – A 16-year-old girl died Monday night after she was hit by an SUV while crossing a Palmdale street, authorities said. The fatal traffic collision happened just before 10 p.m. Monday on 30th Street East near the intersection of Palmdale Boulevard, according to detective John Heald of the Palmdale Sheriff Station. 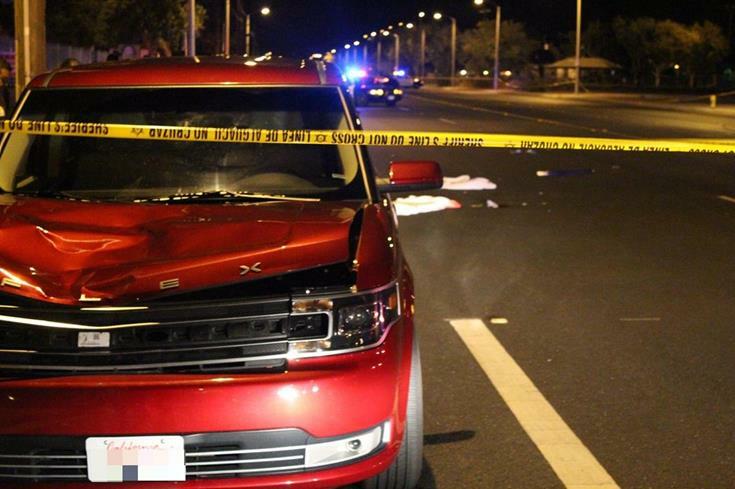 The teen, whose name has not yet been released, was crossing eastbound on 30th Street East when she was struck by a 2014 Ford Flex that was headed northbound on 30th Street East in the No. 2 lane, Heald stated. Prior to the arrival of deputies, an off-duty nurse stopped to administer first aid to the teen. The teen was then transported to a local hospital where she was pronounced dead a short time later, Heald stated. 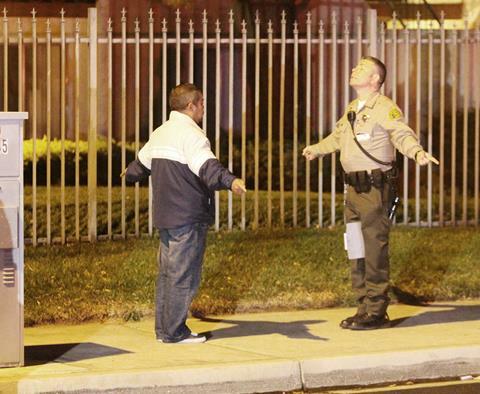 The vehicle’s driver, 37-year-old Palmdale resident Francisco Nunez, was given a field sobriety test that he apparently passed. Nunez was not arrested in connection with the collision. Witnesses said the girl was crossing the street with another teenager and both were outside the crosswalk when the girl was struck. This information was not confirmed by deputies. Officials shut down 30th Street East, between the intersections of Palmdale Boulevard and Avenue R, until approximately 2 a.m. to allow for the investigation. The incident remains under investigation by the Palmdale Sheriff’s Station traffic detail. UPDATED 10/30/13: The victim has been identified at Elvia Concepcion Alvarez-Romero of Palmdale, according to Los Angeles County Assistant Chief Coroner Ed Winter. 58 comments for "Teen struck, killed while crossing the street"
This 50 MPH road with a Regional Park and Bowing Alley, has crosswalks a MILE APART. Who, especially kids, are going to walk a mile, (1/2 mile each way) to cross from the center of this block to get home? I agree with you 100% I live in the apartments right across the street from the bowling alley ,right where this precious little girl got hit. All I see is teenagers jaywalking right there a lot of them with no regard to drivers but im sure this situation is completely different..I think there should be a marked crosswalk in the middle of this street, RIP Elvia. and my prayers go to both family involved in this accident . Education, showing kids and adults pictures of accidents, going to schools and talking to teens and parents about the dangers of jaywalking, tickets for jaywalking, just a few minutes more and She would be alive. Why everyone needs to blame somebody? Has anyone thought about blaming the mom for it.where was she? Who lets a child under age be out at that time? If she was a rebel child is because apperantly her mom never did a good job about raising her. ITS THE MOMs fault. If she would of dedicated time to her child her child wouldn’t be out and about. ding, ding, ding, we have a winner! You are absolutely correct! Sandra you are wrong, kids and adults jaywalk at all times, the problem is nobody is afraid of jaywalking because the police is never around to give them tickets. You’re unbelievable! How dare you place blame on the mother? She just lost her daughter, she’s mourning Back off ! God forbid this happens to you for being so cruel! I hope this happens to Sandra and Sally, I hope they have daughter that are rebel childs that way she can understand that no matter how hard you try to tell your child anything or let alone try to be there they will still do whatever they want no matter what. I know based on experience I am a 22 year old and I was exactly the same my mom and dad would tell me to not do so many things they were always there for me and I didn’t care I would take my screen off sneak out and be home before they woke up… karma is real I hope karma hits Sandra strong and exactly what Palmdale resident said what goes around comes around, may God give this family peace. Such a senseless tragedy and my heart goes out to both of the families suffering. It’s times like this that you sit down with your children, whether they are 6 or 16 and remind them of the basics…look both ways before you cross the street. Just look at the intersections and streets around schools when they get out. The kids are for the most part actually blocking lanes of the road and grab-assing and harassing drivers as though the drivers have no right to be in the road. The real problem is accountability. Parents who don’t hold their children accountable can face this type of tragedy. I am not saying that is the case here. I am truly sorry that someones child died. I am just as sorry for the driver, who was doing nothing illegal and now his life has been changed, and not for the better. This is so sad because my mom was friends with her dad and her dad. The dad was so sad that he couldn’t talk the whole day because he lost a child that meant lot to him. I never met her but I met her brother Luis Francisco Alvarez. He was also sad. That God is protecting her and she being in a new beter world with God. RIP Elvia We will miss you. Really sad that I had to loose my cousin at such a young age. I know she’s in a better place now . May we all have the strength to get throuh this. as well as for the driver and his family I wouldn want to be in his shoes right now. I’m a cousin of the driver and on behalf of my family we are truly sorry for your loss. I can’t imagine how your family feels loosing someone so young. May god help you and your family cope with your loss. I’m not trying to be rude but maybe ur cousin was speeding and didn’t see her u have to be more cautious when ur out driving late at night. If people stop for dogs in pretty sure he saw her but was just going too fast. Did u think about that? There will be justice for this regardless of who’s wrong or right. First I want to start by saying we are EXTREMLY sorry for your loss, our thoughts and prayers are with your family. I am Francisco’s sister and I can tell you that we are equally devastated we cant imagine the pain you must be feeling. Francisco is a sober minded person has never drank or smoked a day in his life a very loving compationate person and is completely devistated . I want to say you are not being rude you just want to explore every possibility for why your sister isn’t here with you today. My brother was actually going under the speed limit and was unable to see her. That being said I truly believe it was an accident and unfortunately they where both there at the wrong place at the wrong time. We pray for your family as well as our and hope that we both can get threw this our condolences are with you and your family and hope that everyone see this for what it was an accident and no one is to blame not your sister and not my brother. I truly hope that people can be respectful for both of our families. I am so sorry Sandra that your brother must live with the guilt of this horrible accident.. I am equally sorry for the loss of the girls family..
That being said, I hope that some will hopefully learn from this that not only do you put yourself in danger but you endanger the lives of the people (Legally The driving their vehicles ) on the street.. I can’t even begin to count how many times I have come close to hitting a pedestrian who is crossing illegally in the middle of a busy street!!! I came close to being in a Multiple Car Pile up on Ave J when a driver in the left lane 3 cars ahead of me decided to stop dead and allow a pedestrian cross the street…There are 3 lanes there, and those of us behind her barley had time to stop..The car behind me wove in and out trying to get around those of us stopped cause he couldn’t see what the hold up was..
As I’m ready most of these comment it’s a very sad situation I an related to Francisco Nunez he the most sweetest guy ever he’s never drank smoked live a very sober person there is no words to describe how he feels he hasn’t slept he just sits on his couch I pray for him and the girls family I think there is no one to blame it was an accident!!!! I agree, sad for both in such a case, poor man has to live with this whether his fault or not, it’s always going to haunt him….his will have to live the rest of his life with this. Sad for the families involved in this, we should all pray for everyone in suffering. Ok so I know that I am not the only driver in the AV that experiences on a daily, yes daily, basis jaywalkers. They see you coming, keep crossing, walk slower, acting as if they have the right to jaywalk. It is so ridiculous to me that people can be shocked when a person gets hit by a car while jaywalking. Adding more crosswalks is not the answer to the problem. Our youth need to learn respect; respect to others, respect of property, respect of the law. I do offer my prayers for this young girls family and for the gentleman that was driving. It is not only young people. So much middle aged people. Like you said they walk slower, act like they have they right, stare you down with a dirty look. It is absurd!! This is so true. Although it is all ages. Not only do they just walk out in the middle of the street where they aren’t supposed to be but the ones using the crosswalks also cross against the lights, wander out there just as the lights are changing, completely ignore all the laws. She was outside the crosswalk, at night when it is dark & had to have seen the headlights. All my sympathies are with the driver and his family, I am so sorry you are having to go thru this because of another persons actions & decisions. Im very sorry for you loss, its called an accident and unfortunately your sister was the cause of this tragedy, under these circumstances i do think you need our condolence. i’m sorry for your loss and my she rest in peace. Yes she made a mistake as her older sister i would like people to see it in our shoes we lost her so young and so soon. Im super sad that it happened in this situation. everyone makes mistakes, please be understanding and not be so cold about it. we have to live with this forever. its harsh how people think so black and white…. Why was she out so late, on a school night I must add. My three teenagers are safely in my home at that time, getting ready for the next day of school. She is aloud to voice her opinion. You guys cant just blame it on the driver only, im sorry for your lost but there both at fault. If you guys didnt want to here what people have to say you shouldn’t have aloud for this to go public. So you’re the perfect mother? Not! So judgmental! Give people a break! God forbids this happens to you for talking Sh****it! I live next door to the family and i gotta say that i am very sad for what happen i will pray that our lord jesus christ be with them threw these hard times, i knew the girl she usually kept to her self always just hi and by but she was very nice and had a good loving family, may god be with yhe family. Honestly happy that the guy who hit this girl didnt have to deal with [removed], I drive alot and see this happen were people just walk out infront of you with no care in the world. I saw a bicyclist today riding in thw opposite lane as me with no lights and no helment and it was pitch black! No wonder people get hit because they think its a game and people on the east side love to jay walk. Humanity just gets stupider. Be sensetive! She was a teen! Let me guess you were perfect when you were 16! 2points. 99.9% of vehicle vs ped accidents could be avoided if the peds would watch traffic. They start crossing the street and think they have a force field around them. Pay Attention! 2nd, deputies don’t enforce these bcuz the DOJ just launched an investigation into the department for stopping MINORITY jaywalkers and that’s racist. Lets face it. Blacks commit a larger proportion of crime and when deputies stop them, they scream RACISM. The only problem is, some people are startingto believe it. Deputies are being accused and some end up fired to be the political scapegoat. So why enforce it and risk ur paycheck and maybe jail time. The only REQUIREMENT is for them to respond to calls for service. The more proactive you are, the more chance of becoming the next scapegoat. Thank the citizens who demand action. Like the death threats to that copper who had to shoot that dog in Culver city when it tried to bite him. J walking is a problem nation wide and incase you haven’t heard there has been a lot of pedestrians getting hit even if they are on a cross walk so I think it’s very unfair for all to just blame it in this poor girl, good thing here is that the gentle man driving stopped shows he has a heart cuz others just run with out a care.. And no it’s not just in the east of palmdale it’s all over AV, LA all California and we need to stop pin pointing out a certain race because there is a little bit of everything in all races there is no particular race that is better than the other really people let’s start being realistic instead of trying to make others look worst then us and I’m including all races not one in particular..
Just remember we are all human and there is no one in this world that is perfect no one. With that said my condolences to the girls family and the driver keep your head high cuz at least you stopped you did good I’m sorry that this happend to you. Excellent comment! Two thumbs up. Peace be with all parties involved. So sad for the driver he must be devistated!! I’m sure the girls parents are too but I said it once ill say it again why are teens in the street at that time?? I keep my kids at home and if they need to go someplace I take them or there dad! If something happens to them while there with us then it is what it is! And yes it’s so damn annoying how much people j walk and yeah they do take there sweet ole time but what really kills me is stupid people j walking with there children exposing them to danger and teaching them to j walk ! I guess to continue the cycle !!! This is very truly sad. I pray for the family of the girl that passed. There is definitely a huge problem with pedestrian. They just walk right in front of you, take their sweet time, and not in any urgency to walk faster. Not only could they cause themselves to be injured, but also other car accidents happening due to them jay walking. Even when it is pitch dark. Off 10th west and I there are so many pedestrians jay walking. I have even seen the cops drive by and do absolutely nothing about it. It is crazy. This is a severe problem in the Antelope Valley and, unfortunately, the pedestrians are not considered to be at fault even when they intentionally run out in front of a car – even when they are clearly old enough to be aware of the possible consequences. I’m sorry that this young girl was killed, and I’m sorry for her family but I truly hope that the driver, who was probably in the wrong place at the wrong time (through no fault of his own) is not treated as the guilty party. This is a 50 MPH road with crosswalks a MILE apart, with a Bowling Alley and a Regional Park on one side, and almost a square mile of Apts and Houses across the street from it. A push button crosswalk is desperately needed between the North end of the Park and the Bowling Alley. This is nothing new to Palmdale, the city where Parks and crosswalks rarely meet. So, so true! Also, the wide open streets at night and high speed limits are an invitation for all the idiots driving at night to speed. NOT that I’m saying that this is what happened here. There isn’t enough information to make a judgement call here. I’m not a big fan of the late night pedestrians who seem to possess little sense, but at the same time, I know to watch out for people, animals, or whatever other random hazard comes my way. Responsibility goes both ways. I’m still waiting for there to be some more crosswalks installed here throughout Avenue S and further down to right in front of Kaiser. Too many vehicle accidents and pedestrians, mostly young kids from the many schools in the area. I hope the street widening project has those planned. you knows crazy? if people walk on the sidewalk and use crosswalks, its pretty rare peds get hit by cars. it is so sad.. a young life taken.. very sorry for both families.. BUT.. you can hardly drive on the streets anymore with all the people just walking across anywhere.. how did this trend happen.. do people think its cool.. they must know better.. and by now so many have lost their lives.. wow what will it take for people to stop this and use the crosswalks. you have to be careful even then.. i just do not understand.. I share the same frustration as others here both for the loss of life and the frequency of incidents. There are a few streets in the A.V. I would never cross outside of a marked crosswalk and this is one of them. I think that maybe it’s time for a bunch of the billboards in the A.V. to get populated with warnings about jaywalking instead of the omnipresent yellow accident attorney ones now casting shadows all over the community. After looking into this a little further it turns out that this is a much more difficult situation than one would expect due to the Department of Justice coming down hard on AV LASD stations in recent history. It seems that the DOJ concluded that jaywalking was used by the LASD as a means to harass minorities. This may be partly to blame for the lack of enforcement by local LASD though I did see that Lancaster conducted an enforcement event in April of this year. Maybe the billboards can be sponsored by local entities as a way to promote awareness and reduce the number of deaths without infringing on the ‘rights’ of minorities. People in Scooters are just as guilty and everyone needs to remember that it’s a lot easier for a person to stop than a vehicle.. oh and the obvious and morbid fact that when a person gets into a game of frogger with a vehicle the vehicle always wins. such a tragedy for both families….one for the loss of a loved one and one for the person that has to deal with the memory of hitting someone. Jaywalking has become such an issue here and you just want to shout at the people for not having sense enough to walk in the cross walks. That area is So dark and very hard to see someone at that time of night. (I drive that area several times a week). Another area is on 20th East between Palmdale Ave and Ave R when the high school lets out. The kids have no sense and cross (jaywalk) the street anywhere they please and amazingly enough there is a sheriff that is parked in the field across the street but he just watches them do it!! This is indeed an accident waiting to happen and then some other families will have to deal with the horror of losing a loved one or being the cause of someone losing their life! Actually there was an accident about 3 weeks ago with a 14 year old boy walked/jaywalked in front of a car when PHS let out. The driver (she) got out, asked if he was ok, then took off in front of many shocked kids. No one got her license plate, including my teens who saw it (btw, I jumped down their throats for it) and I’m surprised no one is talking about it, except for the fact that the teachers the next day asked students to come forward with any info. He was lucky, he only has a broken arm and fractured skull. Every time I drive around town I always see people crossing the street, outside a cross walk. This isn’t the first and wont be the last time that an accident like this will happen. People need to get smart and obtain some common knowledge…Get out of the road people!!! I feel so sorry for both the girl who lost her life and the man who had to experience that :( God help both families!! !